"I really want to study this whole thing of drinking, getting drunk, and people saying that they're having a good time. Because, if you put on a good suit, you put on a good suit or whatever, and you say 'I'm going out to have a good time.' But some people announce it: 'I'm going out because I deserve to go out and I'm going to get drunk because I deserve to get drunk, and get out of my way!" Bill Cosby is a class act, plain and simple. In light of his recent, brave comments before the NAACP, some may feel a tendency to shy away from this comedic mastermind. Well, they would be sorely missing out. Cosby is one of the few comics whose standup routine is an exercise in mastery of both words and actions without having to resort to vulgarity (imagine that, Chappelle!). His routine is a perfect balance of style and substance—the physical contortions and witty observations that manage to bring down the house every time. Bill Cosby: Himself is a filmed performance in front of a live audience on May 20th, 1983. Cosby looks quite a bit younger, and his suit style is just departing from the wide lapeled, nylon-heavy '70s, but his verbal material is timeless as he covers a wide variety of topics. The first portion of this lengthy program covers the best part of drugs, and Cosby's examination of the weekly tradition people undertake under the banner of "having a good time". His demonstrations of the different ways people walk when drunk showcases perfectly timed physical comedy. My favorite portion of this show is certainly his take on the dentist, a profession that I have respect for, but do not enjoy submitting to. Cosby's first comment is right on the money: "Dentists tell you not to pick your teeth with any sharp, metal object. And then you sit in their chair, and the first thing they grab is an iron hook." You say an area is sore, they go picking in that area. How do dentists expect someone respond to their questions and have a civilized conversation when their patient's mouth is open, and a small vacuum is doing its work? 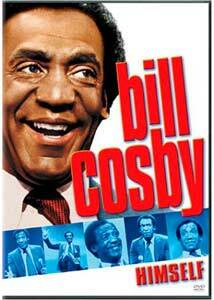 Cosby brings these truths to life with great enthusiasm and visual gags. Most of the program is consumed by life's many stories. Cosby clearly loves his family very much, and he has many tales to share with the audience, most of which he recognizes as proof of God's sense of humor. Coming from anyone else, these events may seem mundane, but Cosby pulls out all the stops and reenacts each situation with a variety of poses, voices, expressions, and his characteristic pauses. He begins by describing the process of natural childbirth he and his wife (well, his wife, mostly) undertook. Later, it's on to the children and their antics, including characteristics of boys and girls, the chronic lying that seems to come naturally to kids, and a classic incident in which Cosby serves chocolate cake to his kids for breakfast. Hey, it does contain eggs, milk. and wheat... Some of these parts are bittersweet in light of the tragic death of Cosby's son some years after this performance. More topics are covered, of course, but in all honesty, some of these later portions kind of fell flat with me. This is probably because I'm not yet married, nor do I have children. For those of you who do, I'm sure these moments will ring true. I still found them amusing and could relate to some of his anecdotes, but there's nothing like the kind of appreciation that would come from extensive, firsthand experience. This was the only downside for me. In the end, I was happy to experience this standout routine, which showcases Cosby's humanity, humility and above all, comedy. Image Transfer Review: Fox's image transfer is presented in its original aspect ratio of 1.85:1 on one side, and a cropped 1.33:1 version on the other. The anamorphic widescreen image is bright, showcasing the color-changing background used to provide some visual flair. This background does lead to some shimmering when the colors are shifting. Multiple cameras were used, and each cameraman has his/her own skill level; at times the image very briefly bounces out of focus. Overall, contrast is good, but there is some softness, grain and print flecks to deal with. Audio Transfer Review: The audio is presented in either a mono or stereo presentation. Both tracks are perfectly serviceable, with clear dialogue and no distracting hiss. Extras Review: The only extra is the film's theatrical trailer. A classic Cosby standup routine is captured in a film directed by the legend himself. Style and substance flow with a program full of life's little situations. Bittersweet at times, but always entertaining, Fox has polished up this gem for the home viewer.